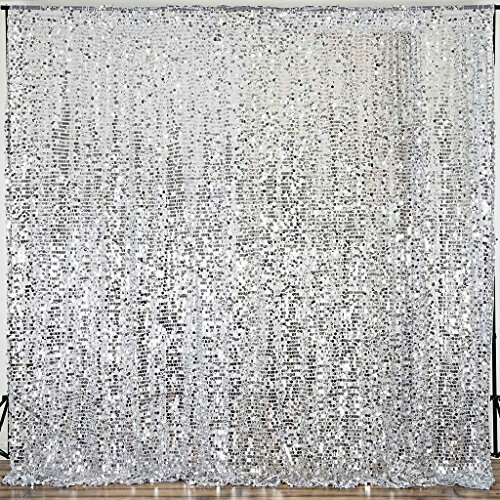 Big payette sequined backdrop curtain from Balsa Circle is perfect for creating a dazzling atmosphere for weddings, parties, events and even trade show booths. Sequined fabric backdrops are the most popular and affordable wedding reception decorations. Add extra fabric or accent it with fairy lights for a truly magnificent look! Sequins are approx. 0.7" or 18 mm wide. Material: Large round sequins on mesh base. 3" diameter rod pockets for easy slide in/slide-out of curtain rods. Backdrop stand and other decorations are not included.